Integrating mindfulness, body psychotherapy, positive psychology, and more, Focusing—used in conjunction with any therapy type—teaches clients how to contact their inner awareness or “felt sense” to spur real change and therapeutic progress. This practical guide explains the core principles of Focusing, how to incorporate it with other treatment modalities, and how to use it to treat a range of client issues. 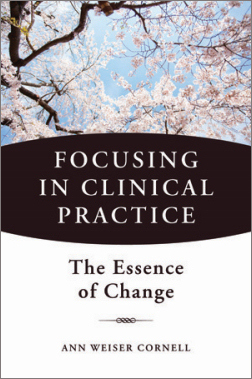 Author Ann Weiser Cornell, who has been teaching Focusing to clinicians for over 30 years, shows step by step how to bring Focusing into any kind of clinical practice. Designed to be immediately useful to working clinicians, this book shows how to help clients get felt senses and nurture them when they appear, how to work with clients who have difficulty feeling in the body, how to support clients who experience dysregulating emotional states, and more. Plentiful examples and vignettes show specifically how the process works at the moment-by-moment level. This clinical guide includes information on using Focusing with issues of trauma, addiction, and depression, combining Focusing with ten of the most widely-used therapeutic modalities, and the clinician’s use of Focusing for herself or himself.